Djibouti City isn't really a big, well known city. Really like Calgary. I am very interested in what you come up with later on. I love Calgary, this is so good! Keep up the great work! Qullasuyu is an interesting one (and I'll get into it when I get to the South American Region), but basically it was a region in the southeastern part of the Incan empire. Basically it is made up of parts of present day Argentina, Chile, Bolivia, and Peru. The main reason they are included though is that I just liked their flag. Great concepts so far! I love the effort you spend on the branding and the realism of the teams. However, Calgary's "Scottish" third kit actually looks very similar to France's national team's traditional style. To make it look Scottish, maybe try dropping the red socks. Overall, this thread has frat potential. Can't wait to see what you come up with next! The "pitch" is just the term for the field that the players play on so "Paint the pitch" is just playing on the idea of the players covering the entire pitch with their movement and hard work. Simple as that really. Check out the club brand book here: CSCC Brand Book. 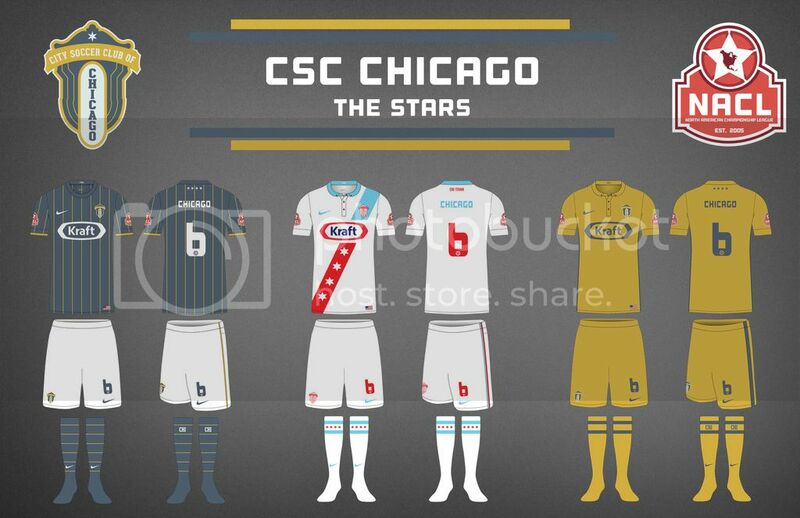 Chicago began the inaugural NACL season as one of the favorites to win the league. They had one of the best players in the world, an owner with deep pockets, and a top-tier fan base and stadium. In their fist league game, their star player broke his leg and was out for the season. Without him, the team plummeted to the bottom of the table and was relegated. With the prospect of playing in the lower division, many of their top players forced moves to better clubs and the owner sold the team after failing to get promoted the following season. With a new owner in place committed to returning Chicago back to the top-flight, Chicago earned promotion in 2008. Since that time, the team has improved almost every year and earned its first Continental Cup berth in 2014, losing in the first round. With an invigorated fan base and building success, Chicago is back to being one of the top destinations for soccer in the country. Home: CSCC had worn a gray-blue shirt with varying sizes of gold pinstripes since their inaugural season. The shorts and socks have changed in different years but this year feature white shorts with gray-blue socks. 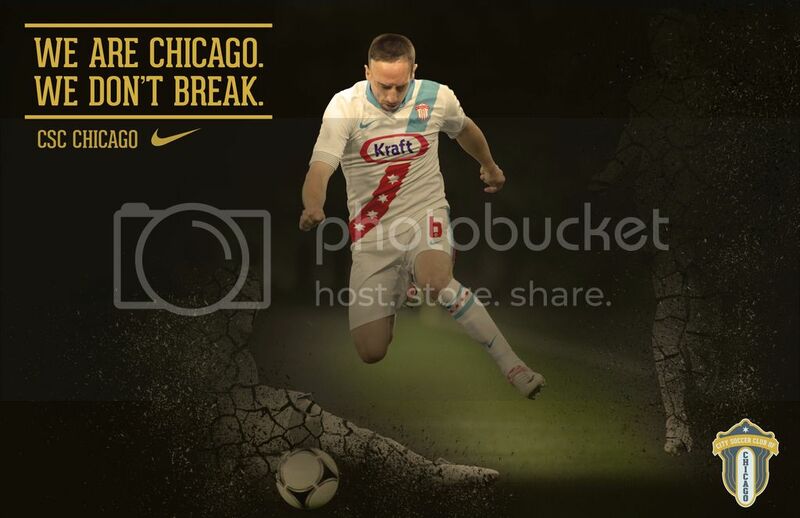 Away: The away kit changes in design each year but is always the colors of the Chicago flag (red, baby blue, and white). Third: The third kit varies year to year as well, but has been gold a few times before. 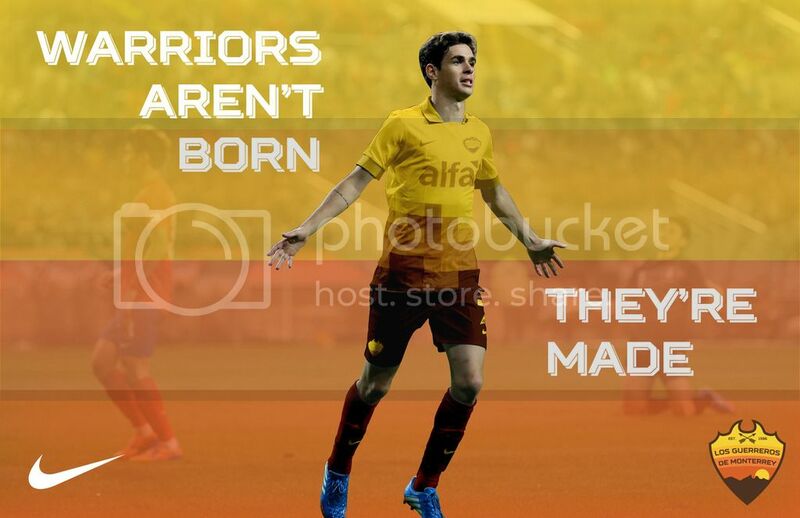 Usually, the third kit color depends greatly on the color of the away kit. I think all of the kits are great. I really like the third kit for Ciudad de Mexico. The little accent from the crest is really clever. Great job! Thanks a lot -- I think Mexico's third kit is one of my favorites as well. Going to be posting the next club in the next day or so, so wanted to give this a quick bump in case there is any more C&C on Chicago. Check out the club brand book here: LGM Brand Book. Sitting at the foothill of the Cerro de la Silla, one of the famous symbols of the Nuevo Leon state, CF Los Guerreros de Monterrey are one of the more unassuming clubs in all of the NACL. Born and raised in Monterrey and determined to bring world-class football to northeastern Mexico, Los Guerreros' owner Santiago Ortiz Alcalde purchased the team with the help of his family members making it the only family-owned and operated club in the NACL. After becoming ill in 2009 (with the club experiencing its worst season ever) Señor Alcalde decided to step down as chairman and left the club to be run by his daughter, Alicia Alcalde. Within the year, Alicia decided to bring in a former Guerreros player to build and coach the team. With an emphasis on fundamental defending and possession focused play, Monterrey began finding success, and as one of the feel-good stories of 2013, went on to win the league and earn promotion to the top flight. With the promotion, Alicia Alcalde became the only female director in the NACL. LGM avoided relegation in 2014 making 2015 the first time they will play back-to-back seasons in North America's top division. Home: LGM traditionally wears brown at home (despite the many colors of their crest) and 2015 will mark the first time they will have hoops on their socks. Away: LGM has a reputation for having some of the most outlandish change kits from year to year (think Marseille in real life) and 2015 is no different. The pattern on the away kit is a pixelated mosaic of the various colors of their crest blending into brown-red shorts. 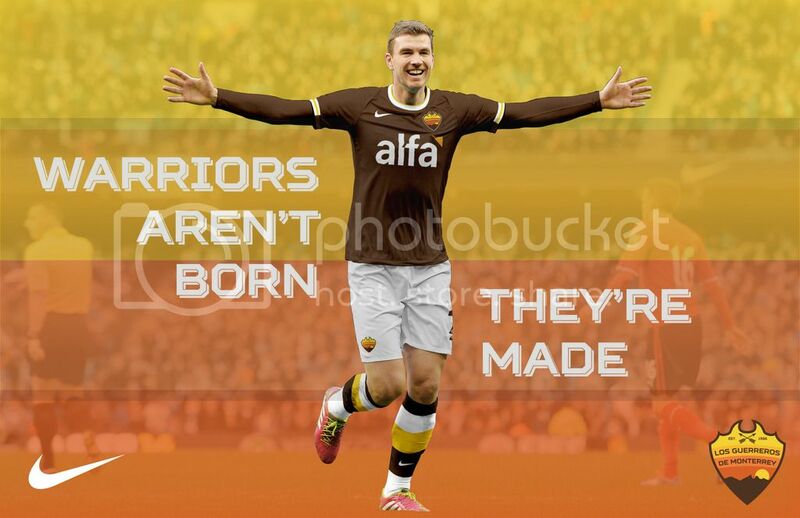 Third: The third kit always features orange in one way or another depending on the color of the away kit. In 2015, the kit is a clean white strip with orange accents and a gradient sock that debuted on the USWNT at the 2015 Women's World Cup. Los Guerreros de Monterrey is the best one yet. I love your use of gradients and the pixelated checkered pattern. Overall, I think the kits work really well with each other. The crest with the arrows and the sunset and bull horns is a masterpiece too. I think you could improve Chicago. For the away kits, I think the sash should be all light blue. Also maybe look for a different sponsor. The Kraft logo looks especially bad on the away kits. 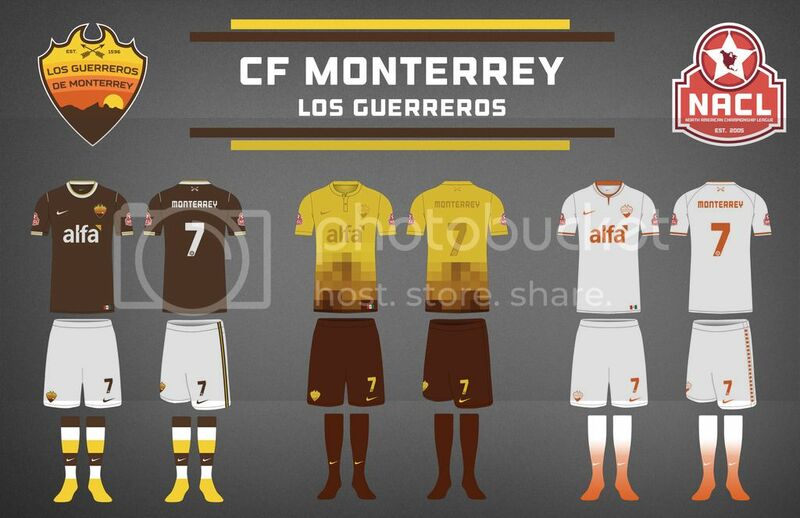 CF Monterrey is a beauty! Really like this series, love the Boston and Calgary unis especially! Thanks! I was skeptical about the brown and yellow, but glad it is being received well. As for Chicago, what do you think it is about the Kraft logo that doesn't work? 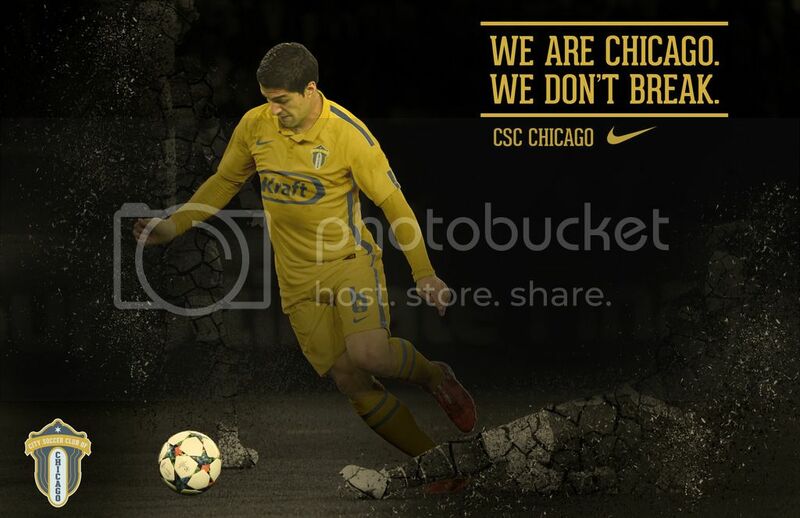 Is it the color on the away kits? Is it just the general style of the logo? 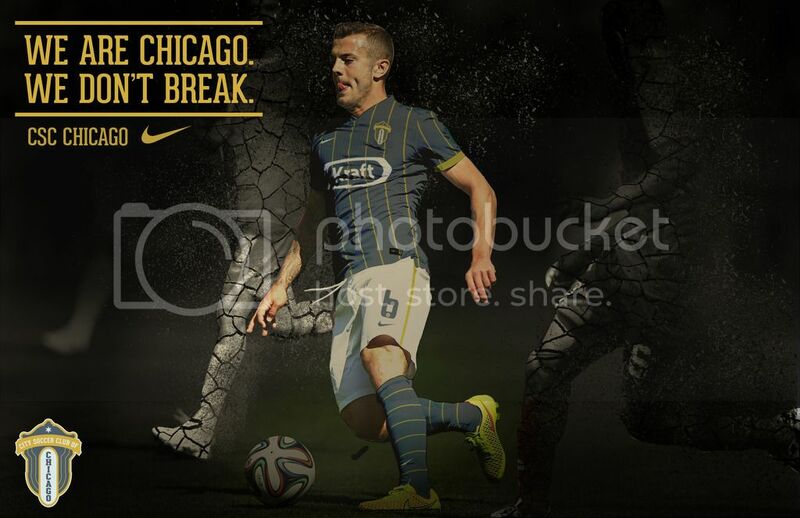 Yeah the color of the Kraft logo really clashes with the rest of the design on the away kit imo.